Stereo Tape Simulator, Other Studio Effect from Sound Skulptor. Sound Skulptor announced the Stereo Tape Simulator, an analog processor that recreates the sonic imprint of vintage tape recorders. The effect is designed to provide the roundness, the punch, the compression and the saturation of magnetic tape, the company says. The STS includes the electronics of a classical tape recorder with variable gain input stage, pre-emphasis stage, recording amplifier, constant current driven tape head, playback amplifier with 6dB per octave attenuation, NAB de-emphasis stage, filter emulating the effect of head gap and differential output stage, according to Sound Skulptor. The IN potentiometer adjust the effect intensity, the OUT potentiometer sets the output level. 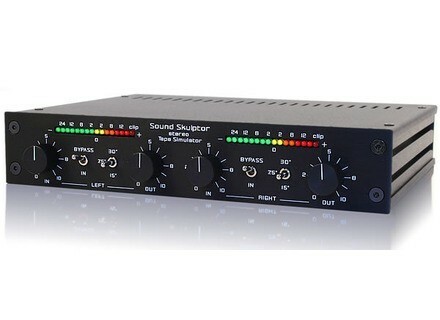 For more information, visit their web site at www.soundskulptor.com. [Musikmesse] A&H iDR-16 + iLive-R72 - and more At PL&S / MM this year the highlight on the A&H stand will be the newly launched iDR-16 3U MixRack and iLive-R72 rackmountable Control Surface. [Musikmesse] Allen & Heath ZED-10FX The ZED-10 and ZED-10FX mini mixers will be making their European debut at this year's Pro Light & Sound / Musikmesse following their launch at NAMM 2010. Kel Audio Song Sparrow Mic Kel Audio has announced the Song Sparrow, a new studio-grade condenser microphone tailored for modern vocal recording.